NEW YORK — Billy Loes, a leading pitcher for three pennant-winning Brooklyn Dodgers teams of the 1950s with an image as an eccentric that fit a franchise long known for its colorful characters, died July 15 at a hospice in Tucson. He was 80. His death was confirmed by his wife, Irene, who said he had diabetes for many years. In his four best years with the Dodgers, from 1952 through their World Series championship season of 1955, Mr. Loes, a right-hander from Queens, won 50 games and lost 25. His best season was 1952, when he was 13-8 with four shutouts and a 2.69 ERA. When the Dodgers faced the Yankees in the 1952 World Series, Mr. Loes seemed to take a cue from the Dodgers’ Daffiness Boys of the 1920s, a team that once had three men on third base at the same time. On the eve of the 1952 Series, Mr. Loes was asked how the Dodgers would fare. He picked the Yankees to win in six games. Then came Mr. Loes’s misadventures in Game 6, at Ebbets Field. Pitching in the seventh inning with a 1-0 lead, he gave up a home run to Yogi Berra and a single to Gene Woodling. Then he balked by letting the baseball slip from his hand while he was on the pitching rubber, sending Woodling to second base. With two out, Vic Raschi, the Yankees’ starting pitcher, hit a ball off Mr. Loes’s leg, and it caromed into right field for a single, scoring Woodling. The Yankees went on to a 3-2 victory, tying the Series at three games apiece. Afterward, Mr. Loes had an explanation for his failure to snare Raschi’s comebacker: He said he had lost the ground ball in the sun. The Yankees won the World Series the next day. 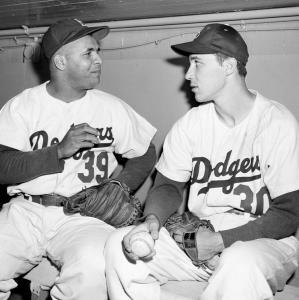 But the article pointed out that Mr. Loes was possessed of a basic shrewdness, having talked the Dodgers’ famously penurious general manager, Branch Rickey, into signing him to a $21,000 bonus in 1948 when he was just out of high school. As for losing the grounder in the sun, Mr. Loes’s explanation was backed up by his fellow Dodger, pitcher Carl Erskine, who told Peter Golenbock in his 2000 oral history “Bums’’ that the sun peeked through from between the two decks behind home plate for a few minutes on October afternoons at Ebbets Field. “When Loes said he lost it in the sun, everybody laughed, and the fact is, if you ever pitched in Ebbets Field, you know that’s possible in October with a ball that’s hit with a little bounce on it,’’ Erskine said. William Loes was born in Queens and became a star pitcher there for Bryant High School. He was sold to the Baltimore Orioles during the 1956 season and pitched for the American League in the 1957 All-Star Game. He pitched for the San Francisco Giants in his last two Major League seasons and retired after 11 seasons with an 80-63 record.